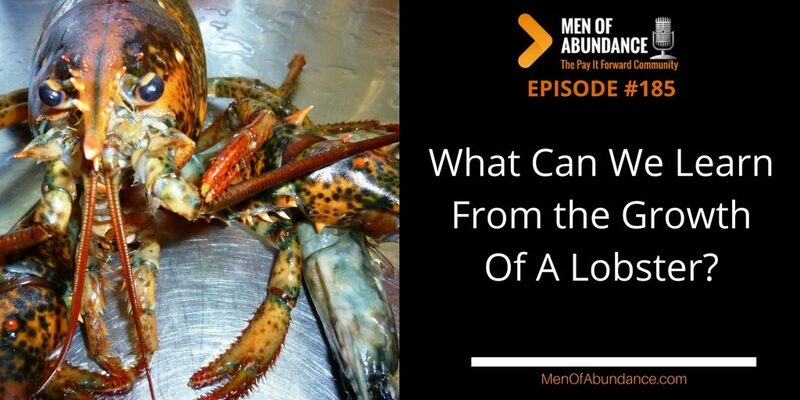 MOA 185: PIFAF – What Can We Learn From the Growth Of A Lobster? What Can We Learn From the Growth Of A Lobster? The process a lobster endures to grow is a great analogy for why feeling stress and the pain of adversity allows us as men to grow as well. A lobster is a soft animal that lives in a hard shell. The lobster shell does not expand. So when the lobster starts to feel uncomfortable, it goes to a safe place, away from predatory fish, to shed it's shell. The lobster must do this several times throughout it's life to stay alive and grow. If the lobster does not shed the shel it outgrows, it will die. The stimulus for the lobster to shed it's shell to grow is that it feels uncomfortable. If the lobster did not feel this discomfort, it would not grow. If the lobster did like many humans, take medication to not feel emotional and physical discomfort, it would die. This very thing is killing many men and women. They may not be physically dead, yet. But they are walking dead and certainly not growing. Because they are not feeling and living through the discomfort that is so important for them to grow more resilient to the adversity of life. Every one of our guests on Men of Abundance have shared their kick in the gut moment. They have shared the pain and discomfort. They have all also shared how they lived through that adversity and more importantly, how they have grown as a result of enduring the pain and discomfort. Do not hide from emotional pain. Confront it and deal with it. As you know, I feel you should talk about it with your spouse, or a few other men you know and trust will at the very least, listen. If you would like to chat, you can start by connecting with a few guys in the Men of Abundance Community. At the very least, get into your Church, or other Mastermind groups with real men who will have your back. Now, go out and live your life of abundance. And make sure you pay it forward. Do you feel you're ready to finally start living your life of abundance in family, faith, finances and fitness? Do you feel there's so much more untapped potential in you? Do you feel like you're always struggling? Are you ready to start actually enjoying your life before it's much too late? We may even get you a path you've been looking for.